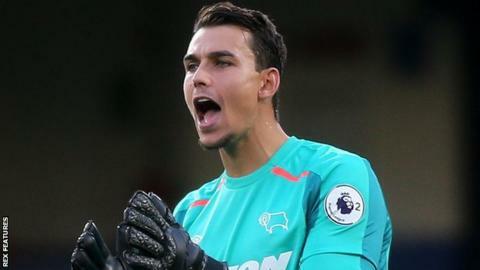 Kelle Roos cancelled plans to see his family in the Netherlands one last time before Christmas to become the seventh goalkeeper to play for Plymouth Argyle in League One this season. He is the third man to join Argyle on an emergency loan this season after injuries to their three senior keepers. The Derby County player helped Argyle beat Gillingham 2-1 on his debut. "I just had to pack my bags and jump in the car and had four and a half hours to call my family," Roos said. Argyle's first-choice goalkeeper Luke McCormick had returned to fitness after an ankle injury in time for the FA Cup second round loss at Bradford on 2 December. But the 34-year-old injured the same ankle saving a shot with his feet in training on Thursday, forcing manager Derek Adams to try to find a replacement at short notice. Roos, 25, had been planning a trip home before the busy Christmas schedule when Derby goalkeeping coach Kevin Poole called to see if he wanted to join Plymouth. He said: "The goalkeeping coach called and said 'Plymouth, do you fancy it?' I said 'yes definitely'. "I have just come back from an injury myself, but I felt good and I'm back to 100%." Roos joined Derby in 2014 but has yet to make a Championship appearance for the club. He has had loans at AFC Wimbledon - helping the Dons beat Argyle in the League Two play-off final in 2016 - as well as Bristol Rovers, Rotherham and Port Vale, for whom he was playing until he was injured in October. Incidentally, Roos is one of nine goalkeepers used by League Two side Vale - another club beset by problems in that position - during 2017. "I had one training session to get to know names," said Roos of his move to Plymouth. "I cheated a little bit. I took the programme form the last game home, I saw the starting 11 and said 'I need to know these names' and I knew the names by kick-off." Argyle have senior goalkeepers McCormick, Kyle Letheren and Robbert te Loeke all injured - a situation described by manager Derek Adams as "ridiculous". Their first emergency loanee Remi Matthews was forced to go back to parent club Norwich City after being hurt in Argyle's loss at Portsmouth in November. The Pilgrims brought in Hull City's Will Mannion, but he had to go back after McCormick declared himself fit. Under emergency goalkeeping loan rules, a loanee can only stay if no senior keepers are fit. The League One side have also had youth team goalkeeper Michael Cooper play one half after Letheren was injured at Blackburn - taking the number of goalkeeper used by Plymouth this season to seven. So how long does Roos think he will stay at Home Park? "I've got no idea," he said. "It depends on injuries and that's up to the medical department. "At this moment I played on Saturday and I'm getting ready for Rotherham. What happens after that, I wouldn't know."